Introduction. The Role of Temporal Factors in Infant Behavior and Development (D.J. Lewkowicz). Time Concepts in Language and Thought: Filling the Piagetian Void from Two to Five Years (R.M. Weist). Measuring Time via Counting: The Development of Children's Conceptions of Time as a Quantifiable Dimension (I. Levin, F. Wilkening). Principles Underlying Time Measurement: The Development of Children's Constraints on Counting Time (I. Levin). Strategy Choices in Children's Time-Telling (R.S. Siegler, K. McGilly). Assessing Children's Understanding of Time, Speed and Distance Interrelations (C. Acredolo). The Representation of Temporal Structure in Children, Adolescents and Adults (W.J. Friedman). Judging the Duration of Time Intervals: A Process of Remembering Segments of Experience (D. Poynter). 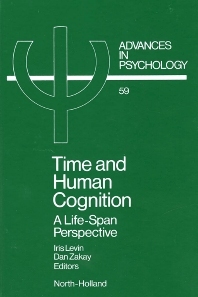 Experiencing and Remembering Time: Affordances, Context, and Cognition (R.A. Block). Subjective Time and Attentional Resource Allocation: An Integrated Model of Time Estimation (D. Zakay). Indexes.